Disney’s Paradise Pier Hotel is Disney’s lowest priced—but definitely not cheap—option at Disneyland Resort. We came into the hotel with a bit of skepticism. It’s Disney’s farthest from the parks, and it is essentially a Disney overlay on a hotel they acquired in 1995. Could it really be worth the high prices? Read on to find out. We’ll break from form and get straight to the point—only book Disney’s Paradise Pier Hotel if you’re booking a Premium (Theme Park) View room. There’s just no other good reason to stay at this hotel. Guests do get access to Extra Magic Hour—which could make it good for a two-night stay (one morning at each park), but that perk is hardly worth the premium you’re paying to stay here as opposed to any other hotel in the area. Disney’s Paradise Pier Hotel is one of three Disney-operated hotels at Disneyland Resort in Anaheim, California. The other two are Disney’s Grand Californian Hotel & Spa and Disneyland Hotel. We booked our Premium View - Club Level room through our choice Authorized Disney Vacation Planner, Lauren Quirk of Enchanted Escapes Travel. Premium View rooms at Paradise Pier Hotel have views of Disney California Adventure. We paid $691.47 per night on an “Magical Stay” offer rate, about a 10% discount from the rack rate. 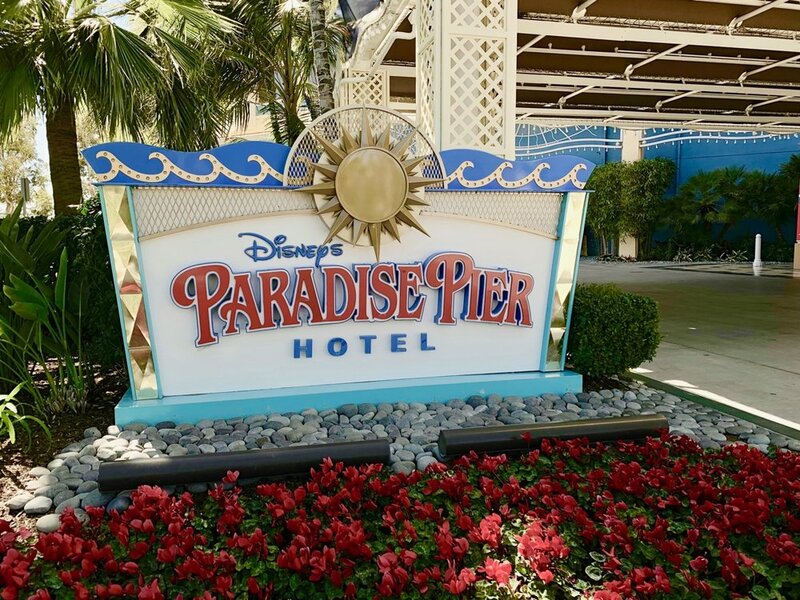 For 2019, Disney’s Paradise Pier Hotel rooms start at $394. Discounts from third-party sites (Expedia, Booking, etc.) are rare. We were coming from a stay at Disney’s Grand Californian Hotel & Spa. When doing split stays, you can have bell services transfer your bags. Unfortunately, that didn’t happen this time, and a Cast Member had to take a golf cart over to the Grand Californian to track down our bags. If you’re coming from LAX, there are a few shuttle options for getting to Disneyland, but if your party is larger than one it will often be cheaper to Uber or Lyft. Check-in was uneventful. We were quickly identified as Club Level guests, and the Cast Member at the desk escorted us to the lounge after she checked us in. Disney’s Paradise Pier Hotel is a single hotel tower with an attached parking structure. The pool is located outside on the third floor. Everything else—check-in, the restaurants, and the store—are located on the first floor. There’s also a rental car station (Alamo). We really don’t have much positive to say about Paradise Pier as far as grounds and theming. There’s nothing wrong with it, but you really can tell this is a Disney overlay on a much older hotel. There is this Goofy statue, though. The hotel rooms definitely do a better job of meeting Disney’s design standards than does the rest of the hotel. …and peppered with a few Disney details. The bathrooms were small, but otherwise okay. The separate room with the toilet was bizarrely dark. The real highlight of the room—and the only reason we’d stay at Disney’s Paradise Pier Hotel again—is the theme park view. From our fifteenth floor room, we had a great look into Disney California Adventure. At night, we had a good view of World of Color, though the music on the television wasn’t working. Unlike the hotels at Walt Disney World, there’s really little to say about location and transportation at any of Disneyland’s hotels. All three hotels are located within walking distance of both parks and Downtown Disney. Disney’s Paradise Pier Hotel is located just south of Disneyland Hotel and Downtown Disney. You’ll be just over a half mile, or a twelve-minute walk through Downtown Disney, from the parks. It’s definitely less than ideal for such a high-priced hotel given the number of lower priced options with roughly as good (or better) locations. Unlike Disney’s Grand Californian Hotel & Spa, there is no dedicated park entrance for Disney’s Paradise Pier Hotel guests—they will use them same entrance as all other guests. 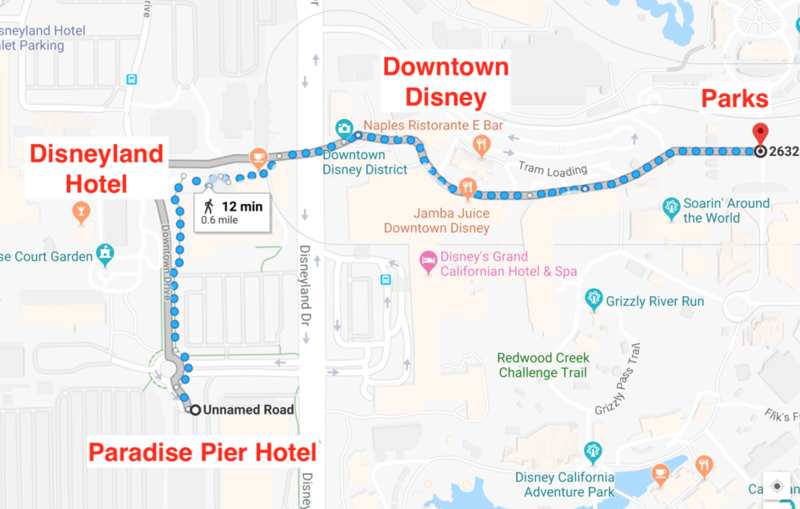 I guess it’s worth pointing out there is a pathway—and it’s on Disney’s map—from Paradise Pier across the street to Disney’s Grand Californian Hotel & Spa, which in turn has an entrance to Disney California Adventure. The problem with this path is that the gate into Grand Californian is room key-protected. You could hope to catch someone exiting, or as a Cast Member to open it for you, but overall it’s probably not worth the time going this way. Keep in mind that because everything is so close, you can access the restaurants of the other two Disney hotels, Downtown Disney, and the parks quite easily. Disneyland is also surrounded by a variety of non-Disney restaurants, including two nearby Starbucks stores in Downtown Disney. This post focuses solely on the dining options at Disney’s Paradise Pier Hotel. Disney’s Paradise Pier Hotel has one character restaurant, and one lounge / quick service restaurant. The casual, character restaurant is Disney’s PCH Grill. This is your standard Disney hotel character restaurant, with characters present at both Breakfast and Brunch. Brunch is served on a limited schedule. No characters are present at dinner. The quick service / lounge option at Disney’s Paradise Pier hotel is Surfside Lounge, adjacent to the lobby. There’s nothing notable about this space other than that it serves food and has a bar. Besides Surfside Lounge, Paradise Pier has one other bar—Sand Bar, on the third floor next to the pool. This is a standard pool bar, but there is a lot of seating (see the gallery of pool photos above). As a hotel, Paradise Pier is no better than the average hotel in the area, where prices closer to $200 can regularly be found near the parks. If you’re looking for a view, the Premium Views from Paradise Pier are probably the best in the area, giving you an awesome look into Disney California Adventure. I might not book one of these again, but it was certainly worth the first visit. And then there’s the other perk—Extra Magic Hour. You could maybe justify two nights at Paradise Pier if you wanted access to two Extra Magic Hours, but we would only advise that if you only had time for a two-night visit to the area. If you can stay longer, you’ll probably be better off staying at a lower-priced hotel for more days. Extra Magic Hour is nice, but two Extra Magic Hours are worth way less than a full extra day.